One of my greatest joys is being able to live so close to family. My youngest sister lives 5 minutes away and we see each other quite often. She and her husband welcomed their first child in March and as new parents they are adjusting very well considering what little sleep they are getting these days. However, the meals on wheels from friends, family, and church have slowed down to nada. So after spending some time with them today I invited them over to dinner.. not to a clean house (that’s the beauty of family) .. but just dinner. That’s the least I could do considering she was up 5 times last night. My kids were really excited to see their baby cousin so they decided to set the table just like a restaurant with menus and place cards. 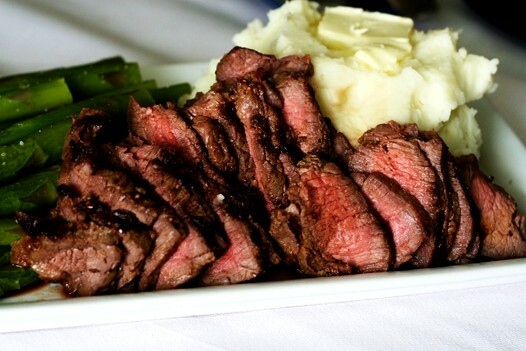 Tonight’s special would be London broil, asparagus, and mashed potatoes. I was planning on making this anyways whether they came or not but I knew they would because she loves these types of comfort meals. Especially now since they don’t leave the house much and even take-out is getting boring. This is my personal preference, but cut the beef in half length wise along the grain. This will make it much easier for slicing, eating, and reduce your cooking time. Sprinkle kosher salt generously all over the meat. Wrap each piece up in plastic wrap and refrigerate for at least 3 hours. 30 minutes prior to grilling, pre-heat your grill on HIGH and remove your meat from the refrigerator to bring it to room-temperature. Unwrap the meat and rub olive oil all over followed by pepper and a little bit of additional salt. 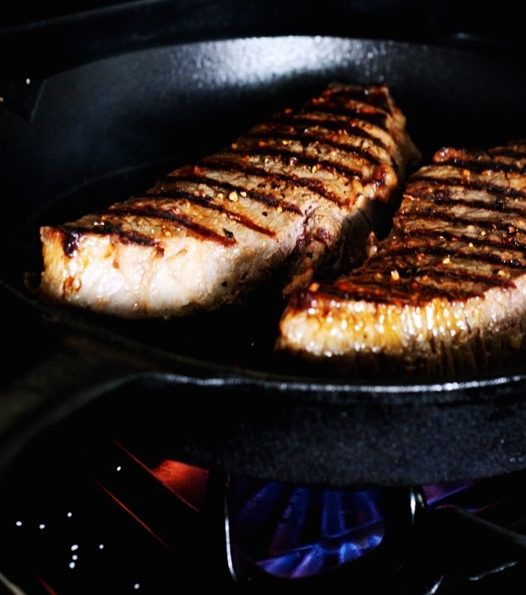 Grill each side of your meat for approximately 5 minutes on each side. Remove from heat and let the meat rest for 5 minutes. Cut into thin slices cross grain. Enjoy. 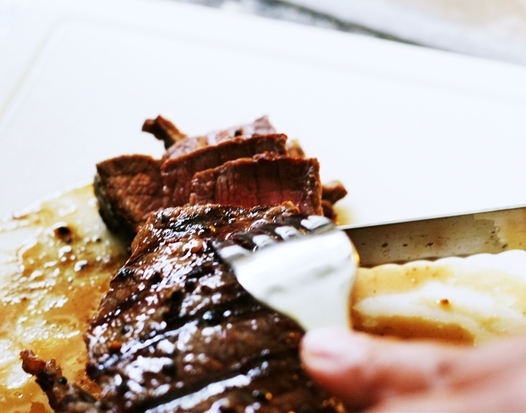 OMG..what a beautiful London Broil…thanks for sharing the way you prepare it . PS: do you like church ,I love church . Thanks everyone! There is something beautiful about buying a cheap meat at $1.99 and having it taste amazing. That is a fanastic way to prepare London Broil, and after seeing CI’s photo of it…yours looks even better! Bookmarked! Beautiful and delicious job! Great pictures and I LOVE the personal touch you put into it all! Your photographs are wonderful and delicious looking. Food photography is very difficult and you make it look easy — the best kind. And your inventive recipes are the best. Wow – gorgeous pictures! 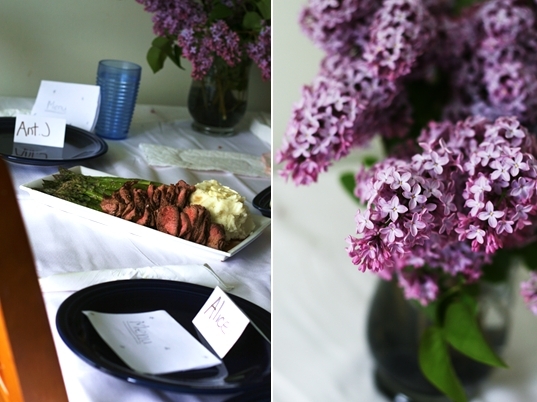 And I LOVE Lilacs – my favorite flower!! 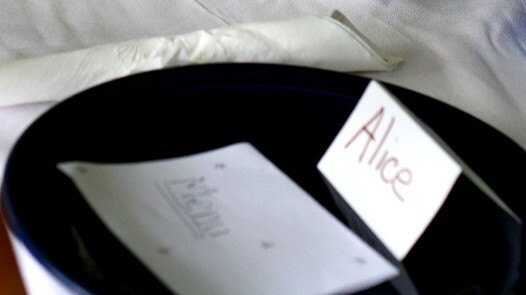 Loved the settings with the placecards and the menu, what a great way to make the guests feel special. And the menu is just my type, simple and tasty! This is simple and lovely. Looks delicious. We eat London Broil kind of a lot. It is the only beef we buy besides ground. I usually marinate it in a gallon ziplock with some italian salad dressing or a balsamic vinegrette. I can hardly wait to try cooking it without all that saucy stuff! Wonderful idea with the place cards. It makes the meal a little more special. Such a sweet reason to have a dinner party! This is one of my most favorite meals! Heavenly Housewife: Yes I am aware they are only in bloom a very short time.. I have several lilac bushes/trees in my yard.. we probably only have 1 more week left of them. I’m going to be cutting several stems and giving them away as Mother’s Day gifts. Jim: Last night I learned that london broil is technically not a cut of meat it is a method of preparation. With that said I just buy whats on sale. I never bother to look to see if its flank or round. Safeway has it on sale this week for $1.99 lb. My thought is.. if you prepare it correctly regardless of the technical type of beef it is, you should have very tender juicy slices of beef. Wow – all of your photos look beautiful, and the steak sounds delicious! 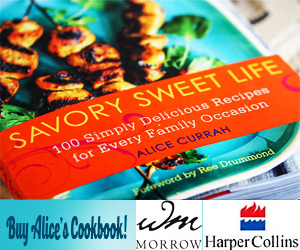 I love the place cards and menus – adorable! Another winner! Reminds me I need to get some beef on the grill! Which London Broil cut did you use, there seem to be a number in the stores lately? I just got drool all over the keyboard. Wow, you did such a beautiful job with that. I am going to bookmark this page and try your advice out. If I could make the perfect London Broil like you, I bet I could get anything out of my Hubby!!! p.s. also beautiful lilacs. i love their smell, it reminds me of childhood :). Did u know they r only in flower 2-3 weeks a year? Enjoy them!